When Freer purchased this jar in 1902, its origins were not well understood. He subsequently described it as "rare" and noted, "I feel confident that this unusual specimen is Sung." It was actually produced in the nineteenth century, and its damaged neck had been ground down and disguised with a wooden lid. The prancing animal and style of painting seem to grow out of a Chinese folk tradition, with the animal resembling the galloping horses drawn with slip on jars from Suzhou, near Shanghai. 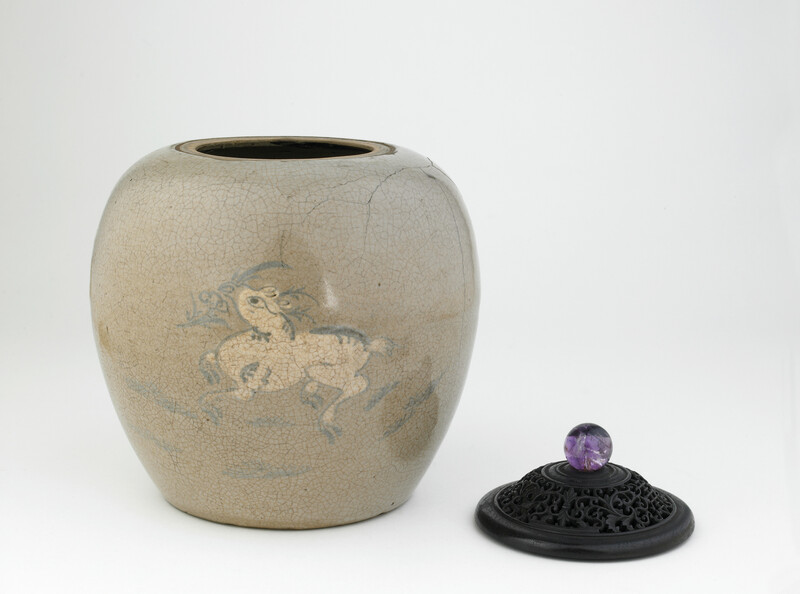 In the Peacock Room, Freer displayed this jar near other Chinese ceramics, including a green-glazed funeral jar and a white bottle with a touch of green, both dating from the Song dynasty. "Jar with design of deer holding lingzhi fungus," in The Peacock Room, Freer Gallery of Art, Smithsonian Institution, Accession No. F1902.4a-b, Item #3199, http://www.peacockroom.wayne.edu/items/show/3199 (accessed April 19, 2019).